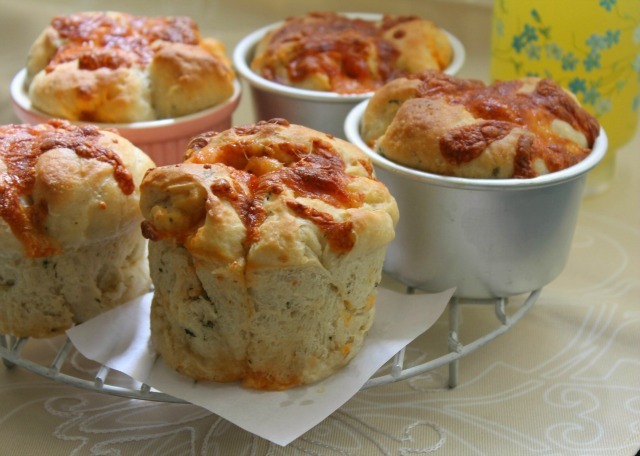 my bare cupboard: Bacon-mozzarella pizza pull apart bread "
Just like when I'm eating loh bak goh or taro cake , there's something about eating savoury breads with a cup or three of milky coffee early in the morning . Bacon and mozzarella ? 'nuff said ! * Preheat oven to its lowest setting and begin warming the flour for 10 minutes then turn it off . * Sift flour , salt , yeast and sugar the add in the oregano and cilantro , stir to combine . Make a well in the centre of the flour mixture and pour in the oil and water . Use a wooden spoon or a sturdy spatula to stir in the mixture until it forms a cohesive dough ; use your hand to incorporate some of the mixture that has been sticking to the sides of the bowl . * Transfer dough to a clean surface ; knead the dough for 3 minutes ( I kneaded mine for 5 minutes ) or until dough develops a sheen and blisters under the surface . Put dough into a lightly oiled mixing bowl and cover with plastic wrap ; leave until doubled in size , about 1 hour at room temperature . * Lightly oil 6 individual tins or ramekins and set aside . * Tip dough into the clean surface , knock the air from the dough and knead it for few seconds . Form into an oval and cut in half . Roll the first half into a log and cut into a roughly 30 grams each , do the same with the other one . * Flatten and stretch each individual dough and add in the filling in the center . 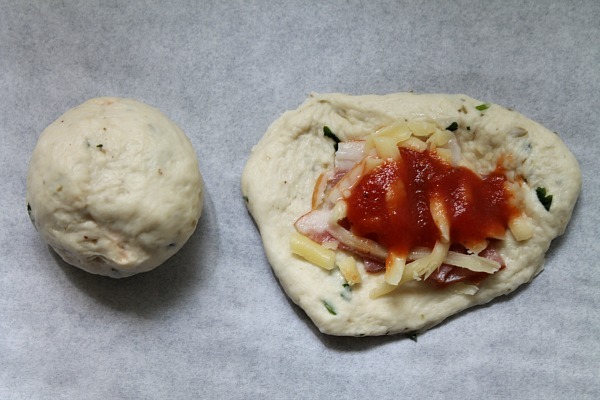 Gather the edges of the dough and seal ; gently roll into a ball . Put 3 pieces of filled dough into each of the prepared tins ; brush with some oil . Let rest until doubled in size . * Meanwhile , preheat oven to 425°F / 220°C . Sprinkle the top with some mozzarella . Bake for 18 minutes or until bread is golden brown . Serve warm or at room temperature . I don't mind having this for my dinner! I'm having leftovers today, sure wish I could have your lovely bread with a cup of coffee. Bacon and mozzarella, they are meant for each other! 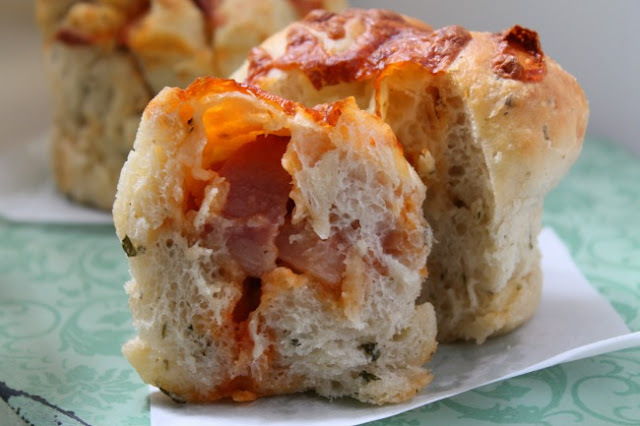 Hi Anne, this is like a mini pizza bread! Yummy filling. looks like a good brekky gid! The QUEEN of bread at work again! Awesome... Would like to have this for afternoon tea tomorrow! I love every word in that blog post! 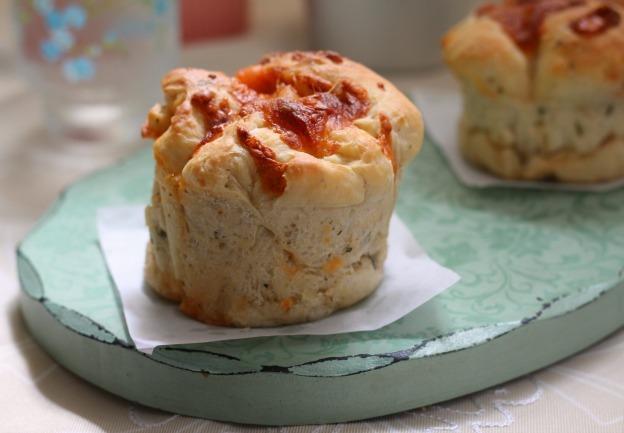 Plus, I've been looking for a pizza muffin recipe I can freeze for quick dinners - this is perfect! This is lovely, Anne! So delicious and soft looking! Oh Anne, i LOVE LOVE LOVE pull aparts! And its not easy to find nice savoury ones here in KL. yup, bacon and mozarella is a winnner. The other is spinach and feta :) i am so gonna try this one pronto! Love the photos with the small tins, too cute! Bacon, tomato and cheese are always a classic combination... and of course, I wouldn't mind having lots of these filling in my bread too. Please pass me some of your yummy pulled apart buns. These are worth all the dirty pans!!! What amazing bread, Anne! This sounds like it is loaded with flavor! Delish!! Hi Ann, pass some this way please. Love the bread and the filling. I always love your bread creations because they always look so good. Anne, I love this combination and the bread look so lovely. Definitely love to try this for sure! i wish to pull some of your yummy bread right now, hahaha..
another perfect bake of you! I will also prefer filled bread if it come with stuffing like yours especially savory ones :) Yours look so cute! Oh these look so great! And whata fun way to get the so needed pizza dose?! good morning, i made bread quite regular but very seldom with fillings, not that i dont like..sometimes it's just lazy me to get more ingredients. I sure love your bacon and mozarella as filling!